Here’s the final mixed version. For the guitars, I added just a little high-end boost to make them stand out a bit more, but I kept their levels pretty much the same. Damnation! That guitar played just slightly dirty through my little 18-Watt Plexi clone sounded absolutely incredible! Didn’t have to EQ it at all. Katie May was set to the middle position (both pickups), but in single coil mode so I could get a bit of that Strat Position 4 jangly sound with the dirt. I was originally going to add a clean guitar track on the left side of the mix, but started noodling with my amp much more overdriven, and decided that I wanted to give the song a bit more of an edge than what it had. So I added it in plus some really simple, but thematic lead breaks over the main riff. This is a VERY special amp to me, and while I don’t gig with it much, this amp with its tube rectifier has a very distinctive tone and dynamics. Standard VRX’s (18 and 22) come with a solid state rectifier – that’s not bad. My 22-watter has one. It just has more attack, and I wanted the feel of bit more sag as I was playing a bit behind the beat. But being a Plexi-style amp, cranked up, this amp has a big sound, and on the “lead” track, I had to make sure I was doing a lot of palm muting to tame the overdrive a bit. But it turned out awesome! Cheapo, but it totally serves my purposes. Don’t know which way is up or down! Enjoy it till it’s time to say goodbye. as if I have to fill up their lives. Before I drive into the office each day, I usually start out early and do some work. But sometimes, there are exceptions; especially when I get a musical idea running around in my head. Then I drop everything and track it so I can come back to it later. Yesterday morning was like that. I was happily pounding out code for a project I’m working on then suddenly I heard this tune on an electric piano. I went to my man-cave and quickly laid down the track. But since I was pressed for time, I just got down the piano part. So this morning I resolved to get a guitar part down. To be honest, I just wanted to jam over the piano part. I never intended my idea to be a full song. Part of it was testing myself to deal with a change from a maj-7 to a minor-dim, and the phrasing I might use. Of course, there are many ways to skin a cat, but I thought about it for a little bit, and practiced some ways I might deal with it. In the end, I decided on keeping it simple. It’s really nothing special as far as the music is concerned, and to be completely honest and transparent, this track is just one of several takes I took while playing around. What was incredible for me in this experience was “Katie May.” This guitar has never ceased to amaze me since I got her. She’s such a dream to play in both tone and feel that she lets me slip into an altered state where my creativity can take over. That’s the mark of a truly great instrument. Katie May has so much natural sustain and a real purity in her tone. There’s a depth to her voice that’s indescribable. Her voicing is perfectly balanced; I haven’t ever had to EQ this guitar when I play her both in the studio and playing out. I just keep all EQ flat, and let her sing! The only thing I do is add some modulation effects to enhance what’s already there. 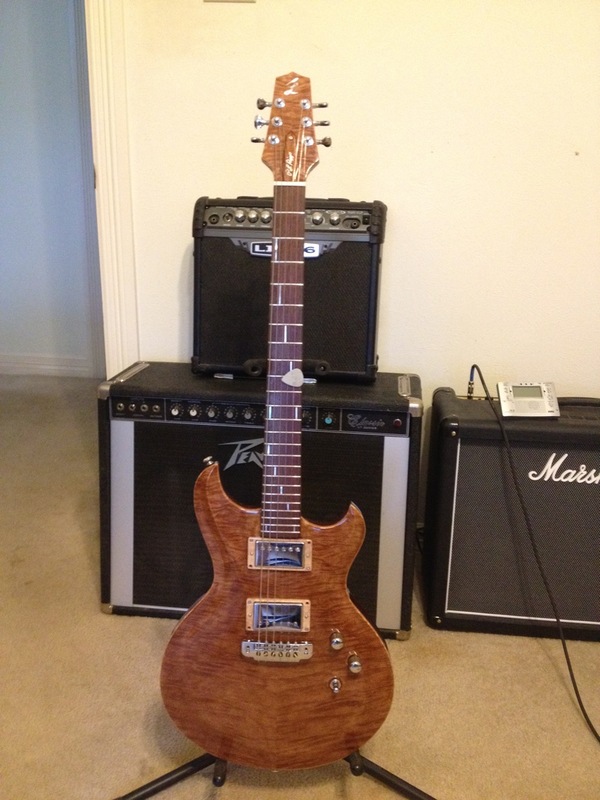 Perry Riggs and Slash L Guitars may not be widely known, but take it from me, if you’re in the market for a hand-built guitar, this is a builder you should consider. My new guitar, “Katie May,” custom made by Perry Riggs of Slash L Guitars just gave me a VERY pleasant surprise yesterday. While I was researching the root cause of a grounding issue I had over the weekend, I contacted Perry Riggs about the wiring scheme of the guitar and how Katie May was grounded. He sent me a very detailed email, plus a hi-res picture of the control cavity, and also explained that Katie May’s humbuckers were coil-tapped!!! I know what you’re thinking: How did I NOT know that the ‘buckers weren’t coil-tapped. The reason is that even though Katie May is a custom-built guitar, I didn’t specify anything in the build. However, as I shared with Perry, when I reviewed her, I very well could have specified the guitar because to me at least, it was perfect – almost as if I had specified everything, even the neck dimensions! Talk about a kismet moment! In any case, I’ve been playing her for the last month or so completely ignorant of the coil taps. And upon finding out about it, of course, I immediately set out to try her out. I actually have a funky clip that I recorded with the guitar in middle pickup as well, but I forgot to upload it from my recording workstation. In any case, in single-coil mode, the maple of the through-neck really shows its contribution to the tone, which has a distinct top-end sparkle. When picked, the sound is “snappy,” which is perfect for clean, funky, comping. So here’s yet another tonal dimension that Katie May offers. I just love surprises! You Gotta Love Variations on a Theme! As I’ve said in the past, there’s always room for people who are good. I said it about Barron Wesley Guitars, and I’m saying it for Slash L guitars made by Perry Riggs. Look at the guitar to the left. Notice anything familiar? It’s patterned after a ’59 Les Paul with a mahogany body and neck, but with a neck-through construction. I have to tell you, Perry’s neck-through design works really well. As I mentioned in a previous article about “Lana”, his guitars sustain for days owing to the that neck-through design. Not only that, if this guitar is similar to Lana, it’ll be less than 8 lbs. (Lana weighed 6.5 lbs). But as to the overall design of this guitar, it’s gorgeous! Of course, being a Les Paul guy, I love that shape, and that spalted maple top and the translucent tea burst finish is killer! 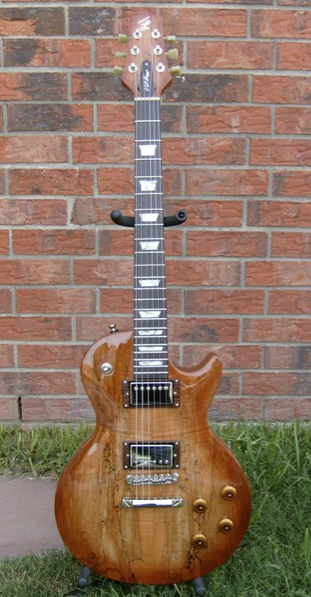 The guitar comes equipped with Lollar Imperials (coil tapped), and has a rosewood neck. Love those trapezoidal fret inlays! By the way, Perry doesn’t have a site, but he’s got a Facebook page (https://www.facebook.com/perry5610). Friend him. He’s uploading pictures of his build process. Very cool stuff.